In this environment, deterrence efforts will have limited effectiveness. Globally, while the absolute number of migrants is rising, this has been as the world population has also increased, so the percentage of migrants has remained relatively stable. Wealthier, more stable countries like the US, Western European countries, Canada, and Australia will always be destinations for economic migrants and refugees, as well as countries like Costa Rica and South Africa in their regions. Millions of people are willing to risk their lives on perilous journeys across Central America and Mexico, the Sahara and Mediterranean, and the seas of Southeast Asia, despite increasingly harsh immigration enforcement regimes because conditions at home are so bad. Let’s set aside that immigration is in fact a net benefit for receiving countries economically, that immigration does not dampen the economic prospects of native-born US workers, that multiple US industries depend on immigrant labor, and that immigration either reduces or has no effect on crime rates. If the Trump administration actually wanted to engage in good faith efforts to reduce the flow of migrants and refugees northwards from Central America, what should they do? Work to improve Central American states and societies. 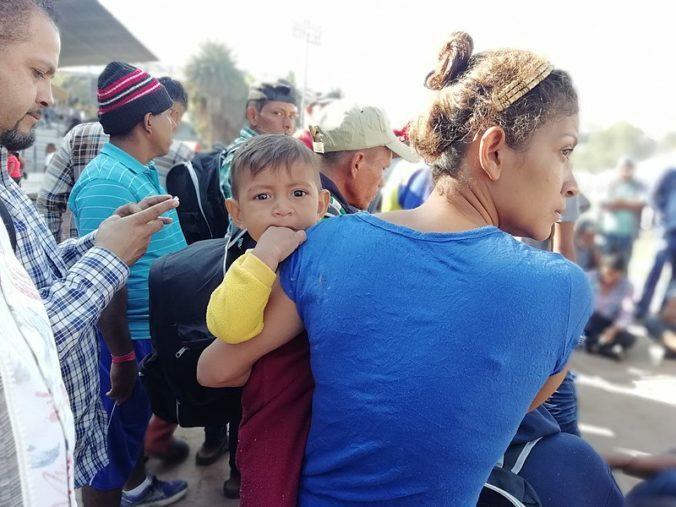 As Eric Levitz puts it, the US “owe[s] Central American migrants much more” than their current cruel treatment, and accepting asylum-seekers and economic migrants is arguably fair repayment for the US role in destabilizing the region. There is a long and sordid history of US military intervention and subversion in Latin America, alongside support for despotic regimes and coups like that in Honduras in 2009, and economic exploitation. The US also bears responsibility for deporting gang members who helped MS-13 become so powerful in Central America and for US consumers’ habits driving the drug trade. There is no appetite, of course, for military intervention in Central America, but the US can help stabilize the Northern Triangle countries and Nicaragua through a combination of aid and diplomacy. Central American governments have tended to resort to ‘mano dura,’ iron-fisted approaches to policing gangs and drug trafficking organizations, but this has not stemmed violence in the region. Evidence from Mexico suggests that government crackdowns simply displace and may actually increase violence. Increasing use of violence by the security forces leads to abuses, outsourcing of security, and greater fear among citizens, reducing trust in the state. Therefore, increasing security assistance is also not a panacea for stabilization in Central America. While violence prevention is an understandable priority, working toward government accountability and increasing economic opportunities in northern Central America are equally important in ensuring people want to stay in their home countries. Corruption, ineffectiveness, and repression have diminished citizens’ trust in government institutions, which limits cooperation with authorities for crime prevention and disincentivizes political engagement and economic investment. The Trump administration, however, has paid little attention to Central America, beyond the occasional statement of concern from the State Department, as Honduran President Juan Orlando Hernández crushed protests amid credible fraud allegations around his reelection; Guatemalan President Jimmy Morales has repeatedly interfered with his country’s UN-backed anti-corruption commission; and Nicaraguan President Daniel Ortega’s government has killed and arrested hundreds of opponents since April of this year. In addition to supporting programs to build accountability and trust, the US should apply diplomatic pressure to ensure that leaders cannot run roughshod over society. Finally, the US can help stabilize Central America by stopping the Immigration and Customs Enforcement (ICE) agency’s terrorization of immigrant communities in the US. Militarized immigration enforcement and the targeting of undocumented immigrants with no criminal record not only tears apart families and communities, it reduces employment among immigrant communities and thus decreases the remittances immigrants send home. Remittances drive economic growth in Central America and improve life there for the family members immigrants have left behind. So if the goal of US immigration policy were to reduce undocumented migration, rather than performative ‘toughness,’ the less ICE, the better. We can expect none of these reasonable measures to be implemented by the Trump administration, but it is important amid the media maelstrom around the migrant caravan to continue discussing feasible, humane immigration reforms and policies aimed at helping Central Americans live better lives in their home countries.